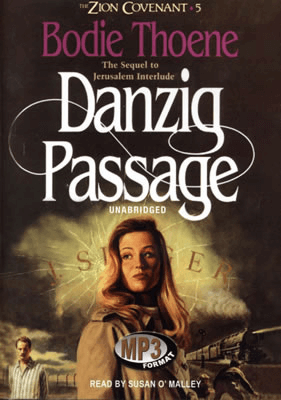 The Danzig Passage is the fourth book in the Zion Covenant, a very good historical fiction series by Bodie Thoene (Bow-Dee Tay-Nee). It continues the drama of the Zion Covenant. The book weaves together the plots of many different people: Lori Ibsen and Jacob Kalner, Peter Wallich, and Lucy, a Bavarian peasant who finds herself in a situation to help them. The book tells the story of these different people in the aftermath of Kristal Nacht, the violent Aryan outburst in the Reich against all Jews. Faced with the loss of their homes, lives, and family, they are left with the only prospect: escape. Lucy is the unwilling mistress of Wolfgang von Fritschauer, a Nazi major who makes Lucy’s life one long nightmare. From then on, Lucy plans constantly for her escape to Danzig, a free city-state in Poland. She unwittingly finds herself sheltering the Wallich family, Jewish, who unexpectedly find refuge in the apartment of an S.S. Officer. With Lucy’s help, Peter Wallich and his brother Willy try to escape to Danzig. The Ibsens and Kalners both went to New Church until Kristalnacht. Pastor Karl Ibsen, an Aryan, was arrested that night trying to bring the Kalners to New Church. By a miracle, Jacob and Mark Kalner escape to New Church, where they join Jamie and Lori Ibsen in a battle for survival in the abandoned church. When a notice for the destruction of the church comes through, both Lori and Jacob forget their arguing and unite in the fact that they must escape. They also, make plans to escape to Danzig. But at the same time, the Mufti of Jerusalem is planning his own purge against the Jews of Israel, wanting to make room for more Arabs. The alliance between Germany and the Arabs strengthens, and Captain Samuel Orde’s leadership of the Jewish defenders is the only thing that is keeping Israel’s defense alive. Lastly, Elisa and Murphy, and Theo and Anna are involved in their own struggle in England, where they campaign along with Winston Churchill to allow refugee children to come to London. Working against the apathetic forces of Chamberlain’s government, they are among the few that see the clouds of war gathering on the horizon. Bodie Thoene is such a good author that the plot is interwoven between three or four parallel stories at the same time. The book is so complex and keeps you guessing at every turn. The rest of the series is also highly recommended, and it’s almost necessary to read those to keep abreast of the plot in this book. However, the author does a good job of making readers able to pick up the book and understand the plot. The Zion Chronicles, a series that comes after this one, is also worth reading. All in all, the book is very exciting and well written. I definitely enjoy it and recommend it. There are a few bad words in the book but they are not many. The plot of the book is definitely one of the best fiction stories I’ve ever read.